Project Angel Food's Divine Design starts this week in Los Angeles from December 3rd through the 6th. This unique shopping extravaganza offers fabuless fashion, home, beauty and gift items at 50-90% off. Check their website for details and tickets at Divine by Design. Click here for details about the Gala Opening Event and VIP shopping party. The sale benefits a cause that is near & dear to my heart: Project Angel Food. Project Angel Food is a free meal-delivery program that serves men, women and children debilitated by HIV/AIDS, cancer, and other life-threatening illnesses throughout Los Angeles County. The program literally brings nourishment to the needy. And this week, it will bring retail nourishment to holiday shoppers looking for a bargain. Over 200 designers contributed to this year's sale. 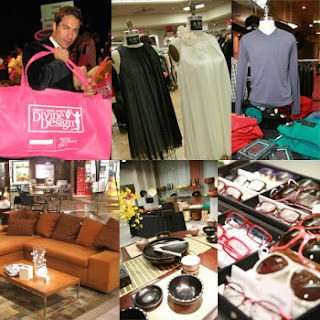 Featured designers @ Divine Design include: BCBG, LAMB, Ports 1961, Trina Turk and many more. The sale features men's clothing (Ted Baker), children's clothes & toys, plus designer brands favored by fashioinistas everywhere. There's also a nice selection of Barbie stuff and kids' toys. I shop the sale for nice gifts for my holiday girlfriend gift packets (stocking stuffers), clothes for work and trinkets for my niece & nephew. I treasure my Trina Turk cashmere sweater that I got at 2 years ago at the sale. I snagged if for well under $100.00. 1 ) You need to purchase a ticket to attend the sale at the door. However, there is a coupon available here offering a $10.00 discount on the ticket. If you pay, remember the price of the ticket is tax deductible as it benefits Project Angel Food. 2) Prices on all the goods will decrease as the sale goes on. Yes, each day the price will drop. So, the lowest prices will be on Dec. 6th, the last day of the sale. However, you might not want to wait until the very last day. I usually do wait until after the opening day to make my purchases, so that the prices will be lower. The sale is open to the general public starting Dec. 3rd at 10:00 am pst. It will be held in the old Robinson-May store adjacent to the Beverly Hilton Hotel. For directions, click here.